Side dish or condiment? 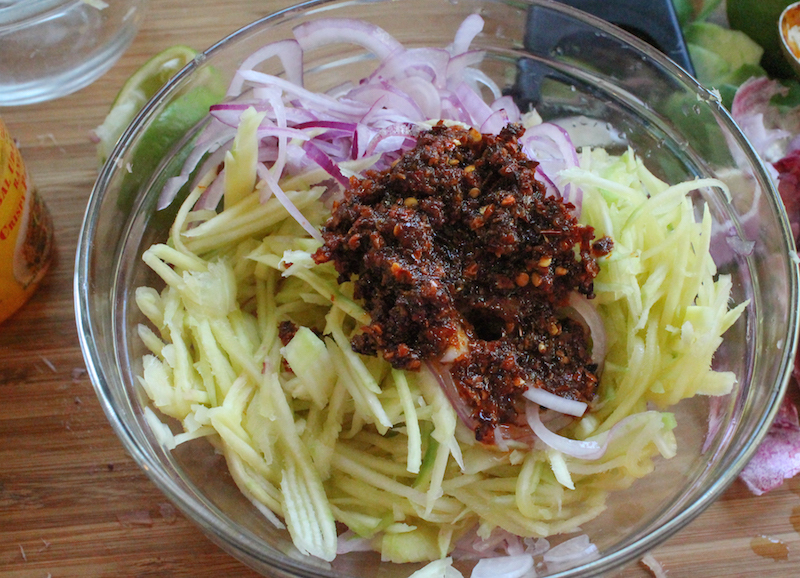 This green mango sambal goes great with Balinese-style grilled fish or any dish that could use some perking up with chili peppers and sharp green mango. 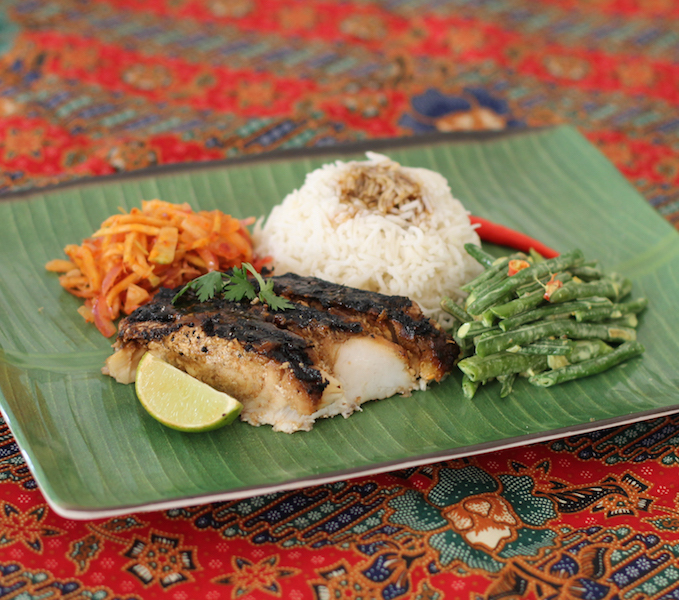 Just over a year ago for another Sunday Supper, I shared a recipe for Ikan Bakar Jimbaran or Bali Spicy Grilled Fish, a whole grouper that had been marinated in a spice paste, then cooked over a charcoal fire and basted with kecap manis or sweet soy sauce. It is properly served alongside a spicy side dish called sambal matah, made from lemongrass, red onions and chilies, with shrimp paste or ground dried shrimp. I changed that up and used tart green mango in place of the lemongrass, creating a dish that is less of a condiment, more of a salad. I rounded the meal out with another Indonesia recipe, recently shared here, long beans with coconut. This week the Sunday Supper theme is Spice is Nice and Some Like it Hot. In Indonesian, we can differentiate between heat hot – panas – and spicy hot – pedas. In fact, many languages have this distinction. Why English, with its huge vocabulary, does not, is a mystery to me. 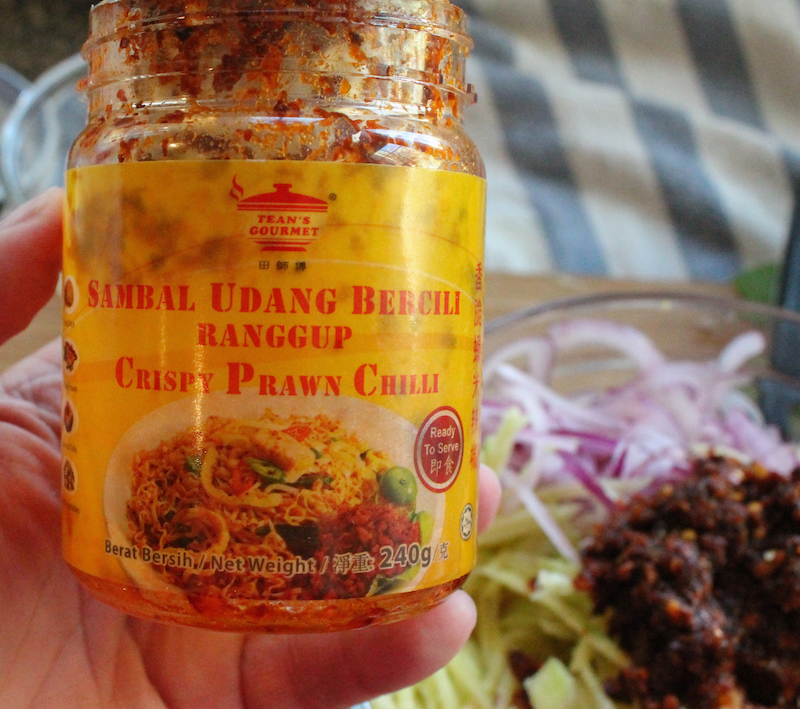 This recipe is definitely pedas or spicy hot! Peel and thinly slice your onions. Put them in a bowl big enough for the whole dish and squeeze the lime juice over them. 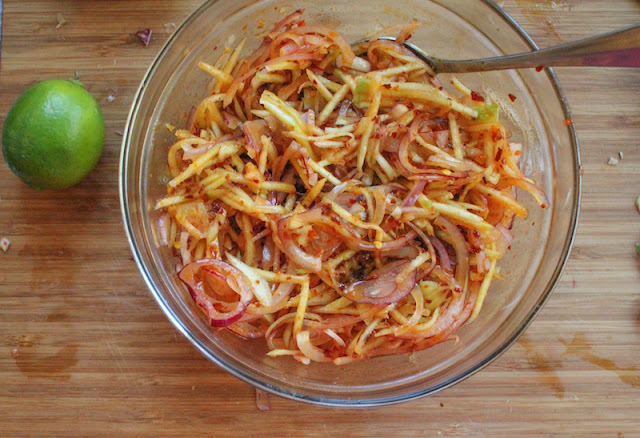 Give it a stir and leave to marinate while you cut the mangoes. Peel one side of your mangoes. 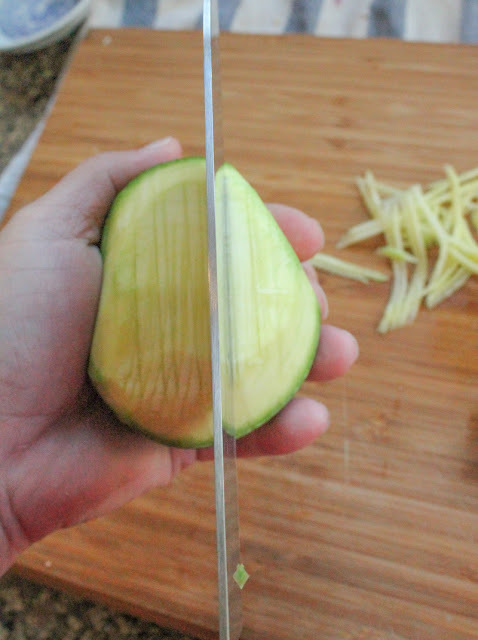 Cut each into tiny strips by carefully hitting one side of it with the blade of your knife. Then thinly slice a layer off. 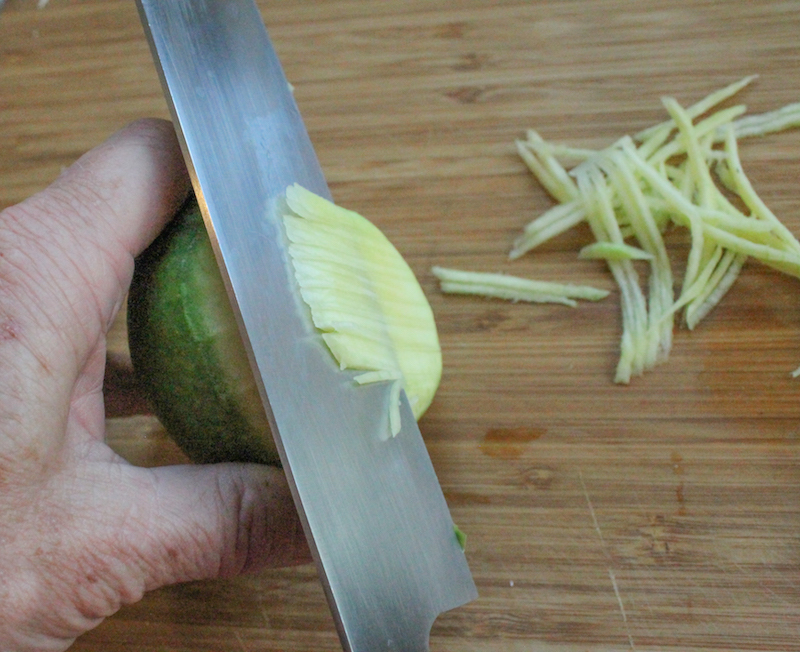 Repeat until you get down to the mango pit, then peel the other side and repeat the process. Add the mango, the crispy prawn chili sambal and fish sauce to the onions. Mix well. Taste the dish and add a little salt, if necessary. If you can’t find crispy prawn chili sambal, use a mortar and pestle to grind the dried shrimp into a fluffy powder. Add in the chili peppers and keep grinding until they make a thick paste with the shrimp powder. Add in enough coconut oil to loosen the paste a bit. 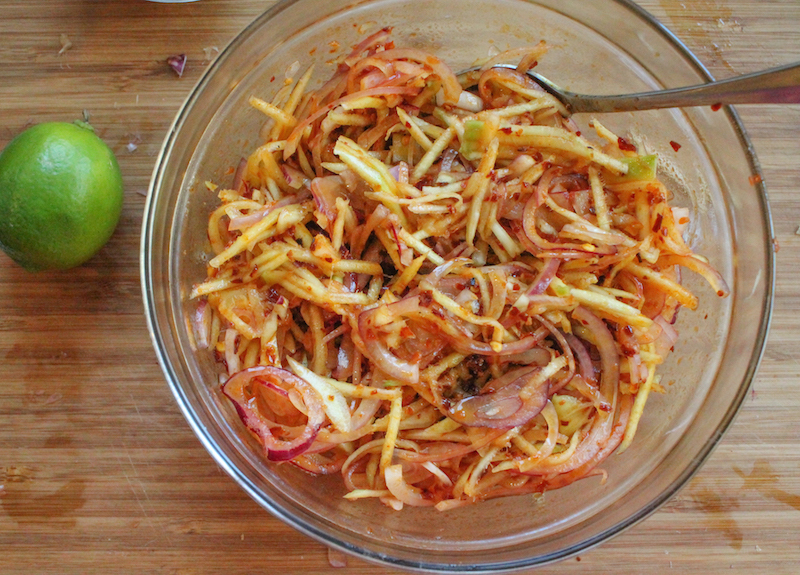 Once you've added this to the mango and onions and stirred well, don't forget to add the fish sauce too. Not every dish that has spices is necessarily spicy hot! Check out this great list of recipes from my Sunday Supper group. Many thanks to our host today, Susan from The Chef Next Door. Tunisian Garlic Chickpea Soup by What Smells So Good?